events take an unexpectedly dark—and fatal—turn. 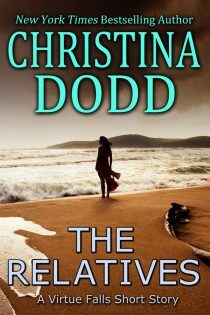 THE RELATIVES are here on Kindle, iBooks, Kobo or Nook! The guest cottage was actually a luxury suite, with a small kitchenette, a bathroom with a shower and soaking tub, and a main room big enough for a king sized bed, a gas fireplace, and a sitting area. The idea of a cottage had been forced on the Gwen and Mario by the realization that people — friends and relatives — were going to want to visit Washington in the summer when the days were long, the weather was warm, and every turn in the road revealed another snow-capped mountain peak or long reach of dunes that led down to an isolated beach. Gwen had designed the cottage and decorated it herself, wisely keeping to cool shades of blue and white, and for color, a delicately patterned Japanese red silk kimono displayed on the wall. She wanted nothing to distract from the centerpiece of the room— the wall of windows that looked out over the magnificent vista of forest, beach and ocean. Gwen waited in anticipation for the gasps of awe and praise. Landon put down the suitcases with a thump. Gwen barely knew how to respond. Guests were always enthusiastic about the idea of their own residence set in such magnificent surroundings. “Well … because … in the house, the second bedroom is small and off the kitchen and has no view. We built this so our guests could enjoy some privacy and …” She stopped herself. She and Mario worked hard. They had built the firm together, they were childless, and they were dedicated to each other. For them, after a hard day at work, having their home to themselves was important, and she would not apologize for offering luxurious accommodations to relatives who had invited themselves to stay. With a snap, she said, “As I said, you’re welcome to visit at the main house at any time. Now, the kitchenette is stocked with juices and healthy snacks. If you’ve forgotten any toiletries, you should find what you need on the tray on the bathroom counter. The gas fireplace is on a timer, so if you wish to enjoy the firelight as you go to sleep, feel free to do so.” She glanced at Landon. He grinned like a normal man who looked forward to a romantic evening with his wife. But he kept his mouth shut. Landon was tall and lanky, with a gaunt look around his cheeks and prematurely gray hair. He hadn't said a word since his initial, Hi, good to meet you, and Gwen wondered if Cecily withheld food as punishment for insubordination. “I’m sorry to hear that.” Gwen was pretty sure she didn’t give a damn. Gwen, and her liver, were speechless. Please accept my invitation to join my mailing list so I can notify you when my new titles are released!